Carousel Floors FAQ's What are the best flooring solutions for pets? 1. What are some key factors to consider when deciding on a flooring color? When you visit our showroom it’s a good idea to bring some sort of color reference such as a paint chip, photo, fabric swatch, or even a pillow. Once one of our custom flooring experts helps you to narrow down your choices, it’s best to take several samples of floor colors you’re considering home with you. The source of light in a particular area can drastically change a color by up to 20%. It’s best to assess your sample in morning light, day light and in incandescent or fluorescent light. It’s also important to consider the reflective light from other colors in the room. We are more than happy to give professional guidance when we visit your home for a quote, but ultimately color is experienced emotionally, and how you feel about a color when it’s placed in a particular room should be the determining factor. 2. 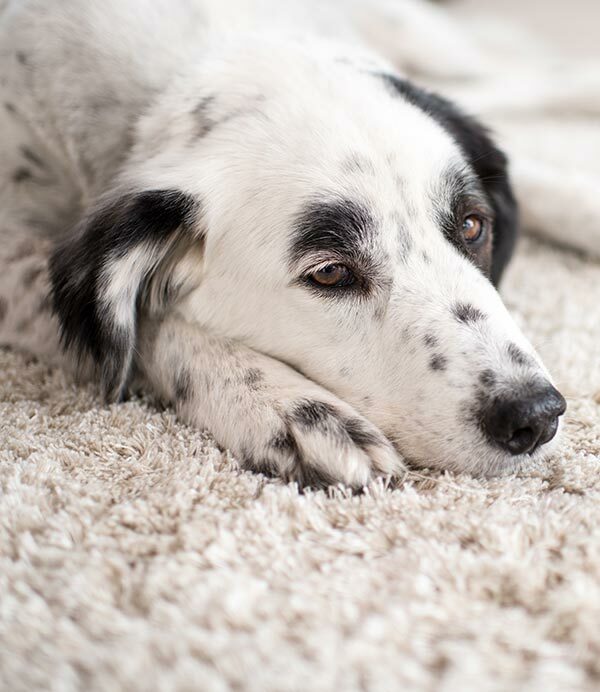 We have multiple pets, what are some of the best flooring solutions for excess odor and fur? Unsightly accidents and digging claws can be harmful to any floor. You can reduce the chances of irreparable damage by selecting products that have odor control, are anti-bacterial or have moisture barriers. If opting for carpet, consider cut pile carpeting rather than loop pile, which can easily snag or run when met with an overzealous claw. How do I know the flooring I purchase will last? Although fiber and mill warranties are a good guide, having the right flooring fit for the particular home and usage can have a lot to do with the longevity and look of the flooring. This is where personalized service is key. Our flooring professionals carefully guide you through every step of the selection process to assess crucial factors such as the type of room or rooms to be covered, the number of people in the home and whether or not there are pets or children. Although traffic frequency is a factor, types of traffic and sources should also be given careful consideration. This will help to determine the appropriate brand, style, surface type and finish. 4. Is there a certain carpet that’s better for allergies? Carpets today have been improved for better indoor air quality, and a lot of potential allergens have been removed. There are products available now that absorb allergens such as odor, pollen and chemicals. Wool, with it’s scaly fibers, naturally absorbs irritants like pollen and dust mites, rather than releasing them back into the air. 5. I have a historical home in Pasadena, how do I select flooring that will maintain the integrity and style? Since we are in an area saturated with pre and post-war era homes we offer many flooring choices that are complimentary, such as narrow width hardwood flooring and linoleum, which dates back to the 1800s and was heavily utilized in the 50s. Products laden with asbestos that were once used liberally are no longer available, but we do have vinyl tiles that closely resemble the look. We also offer wool and woven carpet that were characteristic to the times. 6. What floor covering would make the most sense for a bathroom? It depends on how much control there is over water and moisture. If you have splashing children or a husband that seems to get joy from shaking water onto the floor, then ceramic tile or vinyl are a good choice. If bath mats are used and very little water tends to get on the floor, then even hardwood could work. At one time it was popular to put carpet in bathrooms. We do not recommend this. Ultimately any excess water that gets into seams or edges and saturates the sub floor will ruin the flooring regardless of what kind it is. It is best to make it a habit of bathing with care and consideration for your flooring in order to avoid expensive repercussions.